Italians love this season so much that they commemorate it for an entire month, beginning on the evening of December 7, when the townspeople make a huge bonfire in front of the fortress, to simulate the light with which the angels guided the Three Kings to the Holy Manger. The next morning, children wake up to find a small gift on their pillow, left there by the Holy Virgin. The period between mid-December and early January was one constant celebration even in pagan Rome. 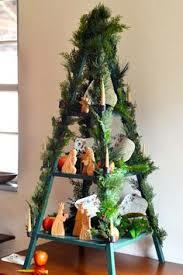 It began with the Saturnalia, a winter solstice festival, and ended with the Roman New Year, the Calends. After Emperor Constantine adopted Christianity, instead of ending the holiday at the New Year, the celebration extended to January 6 when the Three Kings were believed to have reached the infant Jesus, and so the Romans, too, began to exchange presents on the Epiphany. 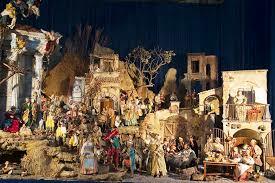 Today in Italy, Christmas trees are decorated, but the focal point of decoration is the Nativity scene. Italians take great pride in the creation of the manger, which was a sort of clever publicity stunt thought up in 1223 by St. Francis of Assisi, who wanted to involve the peasants in celebrating the life of Jesus. Bagpipes are the most common Italian Christmas sound. The zampognari, the shepherds who play the bagpipes, come down from their mountain homes at Christmas time and perform in the market squares. The melodies played are adapted from old hill tunes. 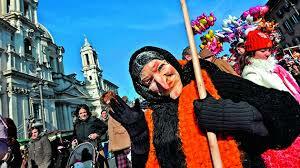 Modern zampognari wear the traditional outfits of sheepskin vests, leather breeches, and a woolen cloak. 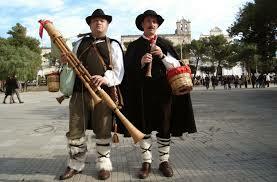 The tradition of bagpipes goes back to ancient Roman times. Legend says that the shepherds entertained the Virgin Mary in Bethlehem. Today, the zampognari perform their own private pilgrimage, stopping before every shrine to the Madonna and every Nativity scene.